Life is what happens while you were planning what you were going to do next. What I was going to do next was to tell you about someone I admire … but life happened hehehe. I have a few things that need my attention and I will be back on 6 October. In the mean time, go out and enjoy this beYOUtiful fall weather. Take care … see you soon my friends! I grew up in the South in the 1960’s and 1970’s. The world I grew up in was still pockmarked with the scars from the Civil War (or The War of Northern Aggression, as we call it). 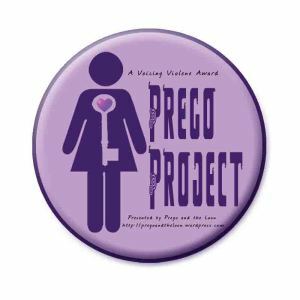 The scars were not obvious, but they were not hidden either. The indentations left from horseshoes on the altar of an Episcopal church. A union officer rode his horse down the aisle up on the altar and took over the church as his headquarters. Then there were scorch marks on the baptismal brazier, union soldiers used it to cook chicken in. Then there are the people too, a sharecropper trying to eke out a living for his family on another man’s land. When he did not produce enough crops for the landowner, he and his family were kicked off the land and out of the house that went with the land. What happened to the little farm? The landowner’s slaves replaced the sharecropper, and life went on. Yet, when the war started this man, this poor sharecropper, donned a grey coat and left his family to fight the Yankees. I knew this man did not fight to protect slavery; he had to compete against slave labor to feed his family. As I became a man and moved north, I began to wonder if what I learned about Southern history applied to all history. Was Napoleon really the megalomaniac we were taught, the anti-Christ Nostradamus predicted? About this time, I began to read about a French doctor, a simple family physician, who left his field of chosen endeavor to stand up for his country and defend it with arms. What this man taught me was that the victor does write the history books, and that even a simple family doctor is capable of extraordinary things in extraordinary times. This simple doctor who changed my approach to history is the man I want to introduce you to next. The beginning of love. » I Love My LSI. At the end of August I had more hits on my page than I did in all of 2012, and we still have four more months to go. You did that and I really appreciate you for that. You put a smile on my face and a happy tune in my heart. Comments Off on Thank YOU ! The last two rigid airships in the US Navy’s arsenal were the Los Angeles ZR-3 and the Akron ZRS-4 (click here to read the early articles on the Shenandoah ZR-1 www.wp.me/p1MLkF-19V and the Macon ZRS-5 www.wp.me/p1MLkF-17G). There was a ZR-3 but it was crashed during construction in Britain the majority of the crew were killed, including 16 men in the United States Navy who were training to fly the airship back to New Jersey. ZMC-2 is listed as rigid airship, but it was not really, what we think of as a rigid airship. ZMC-2 was a blimp with a metal skin instead of a fabric skin. ZMC-2 was the only metal skin airship ever made. 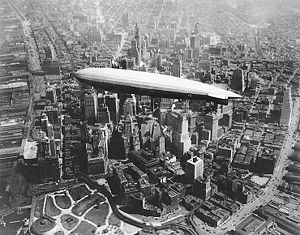 The Los Angeles was the only German built rigid airship in the United States Navy. This airship was built in 1923-24 and was turned over to the United States as war reparations. Once the Los Angeles was turned over to the United States it was converted from hydrogen to helium, this reduced the payload but increased safety. During its service life, it flew 4,398 hours for 172,400 nautical miles. The navy used it as a flying observatory, a training ship for airship crews, and experimental platform; this was because the terms of the agreement which gave the Los Angeles to the United States the airship was only allowed to be used as a commercial and experimental platform. The United States asked and received the permission of the Allied Control Commission to use the Los Angeles in fleet exercises in 1931 and 1932. 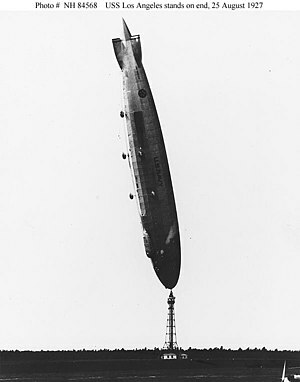 The Los Angeles has many notable first including the testing of the trapeze system the United States used to launch and recover airplanes from an airship. The most unique experiment occurred on 25 May 1925 when the crew of the Los Angeles had an on-air conversation with a radio announcer on WGY using a photo-phone. This technology used a beam of light to transmit sound. The Los Angeles was decommissioned in 1932 because of the depression, re-commissioned after the Akron accident in 1933. Then in 1939, the Los Angeles was decommission and disassembled in its hangar. The end of a long and grand life. 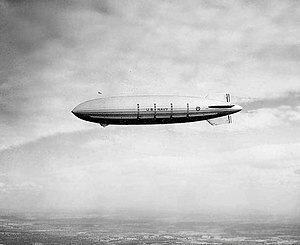 The Akron was built in 1929 through 1931, and went through four accidents; the last resulted in the loss of the airship with a great loss of life. The Akron had a unique feature similar to its German sister ships, a weather station on a cable that could be lowered from the airship while in fog to look for clear air below. The weather information was transmitted via radio back to the Akron. The first accident happened in February 1932 while the airship was being removed from its hangar. The tail section of the airship came loose from its moorings and struck the ground causing heavy damage. The second accident happened after the Akron finished its first trans-continental voyage. Attempting to moor with untrained ground crews took longer than expected in the hot sun. The Akron began to float upwards during the mooring and the mooring cable was cut to avoid a nose-stand. Most of the ground crew let go of their lines. One man held on until he was 15 feet in the air and broke an arm on landing. Two other men were carried up much further and eventually fell to their deaths. A third man tied himself to his line and was hoisted aboard the Akron an hour later. The third accident saw the tail of the Akron entangled in a beam in its hangar as it was being attempted to be removed from the hangar. The Akron spent quite a bit of time as a flying aircraft carrier as did its sister ship the Macon (see Macon article). Another experiment was a “spy basket.” The idea was for the Akron to stay in the clouds and lower an observation station below. The “spy basket” was tested with sand bags instead of crew, but unstable swinging from side to side. The idea was scrapped and never used. The Akron also conducted numerous fleet exercises. The fourth accident of the Akron was the death of the Akron and the ultimate death of the US Navy rigid airship program. On 3 April 1933, the Akron went through a severe storm. At 12:30 am on the 4th the Akron was caught in a wind-shear. The airship began to rise and then was almost immediately caught in the downdraft of the backside of the wind-shear. The airship was taken to full speed ahead and ballast was dropped. The airship was nose up (12 to 25 degrees) trying to gain altitude when the tail section struck the ocean off the New Jersey coast. All of this with continuing violent wind gusts. The low fin of the tail section was ripped from the airship and it began breaking up over the ocean. Three men were recovered, one died later. A total of 73 men died with the loss of the airship, including civilian VIP’s and Admiral Moffett (Moffett field is named after him). Admiral Moffett was the rigid airship program in the United States Navy. Without Admiral Moffett to sing the praises of airship and fight the battles to keep the service active, it was only a matter of time. It is a shame to see skies void of airships. They are majestic workhorses of the sky, with just a twinge of romance thrown in for good measure. I believe the airships fill an important space between expensive fixed-wing aircraft and slow moving, ocean-going ships. Less expensive than planes and faster than ships. Maybe one day we will see a return to their use to fill this void.